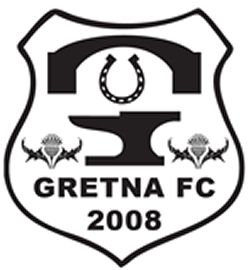 Gretna were first to test the goalkeeping conditions on a very wet Raydale pitch with Brandon Longcake striking from 25 yards and Mark Tait unable to hold the fierce shot but managing to scramble the ball away for a corner. Although the home side looked the more likely to open the scoring it was Uni who scored in the 8th.minute after a defensive mix up Willaghan was on hand to prod the ball into the net despite Wright’s attempt, 0-1. A break down the left by Longcake almost produced the equaliser when he outpaced the Uni left back and evaded Tait’s challenge but it was enough to force Longcake wide and his effort hit the side netting. Gretna almost fell two behind when a slip by McGuffie presented a chance for Willaghan but the number eight fired wildly over the bar. At the other end Adam Main spurned a good opportunity to get Gretna back on level terms when he fires over from just outside the box. In the 17th. minute Scott Milligan found space on the edge of the box and placed the ball beyond Tait into the net, 1-1. Play was end to end as both teams fought for the lead and Willaghan nearly put Uni back in front but was denied by the post with Wright beaten. Longcake was on song with his mazy runs and powerful shooting with the Uni’s Tait not able to hold most of his shots. In the 33rd.minute Anderson went close with a header that smacked off the post and Milligan was first to react with a powerful drive that hit Tait and went behind for a corner. 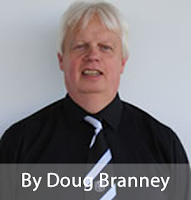 Gretna went into the lead with probably “goal of the season tag” attached to it. Longcake unleashed a ferocious shot from outside the area and into the top corner of the net, 2-1. The home side continued to press and Milligan again tested the over worked Tait. H/T 2-1. The start of the second was fairly even with both sides trying to master the wet conditions. Uni were forcing the home defence into errors and giving away free kicks around the box. Gretna managed to hold firm and gradually took control of the second half. Graham wasted a chance when he failed to keep his shot down and ball sailed harmlessly over the bar. Anderson went close in the 65th.minute but again his shot was too high. Rome made his first change with Joe Slattery replacing Connor Graham. Milligan had an effort saved by Tait as the home side moved in for the killer third goal. After a free kick on the edge of the Uni box found Milligan, unmarked the Gretna number ten smashed the ball at Tait who spilled the ball at the feet of Anderson who duly hammered the ball into the net, 3-1 in the 75th.minute. or the scoreline could have been greater. G.Wright, J.Blake, G.Thorburn, R.McGuffie, A.Inglis, D.Addison, C.Graham, A.Main, I.Anderson, S.Milligan, B.Longcake. Subs : J.Slattery, S.Rudd, N.Cassidy, M.Worrall, R.Halliday. M.Tait, F.Thomson, J.Maelger, C.Irvine, D.Black, F.Daniels-Yeoman, D.Ward, C.Willaghan, J.Guthrie, G.Nikolaidis. Subs : N.Evans, J.MacFarlane, R.Chatterjee, H.Flett.